We would love for you to get involved. Any way we can help you, please don't hesitate to contact us! Greg Armstrong is a high school teacher at Friendship Christian School in Lebanon, Tn. He teaches Biology, Bible, Environmental Science, and Anatomy and Physiology. Greg has been competing as an ultra-marathon runner since 2009. Since then, he has represented USA as a member of the 2015 USTF 24 hour team, competing in the 24 Hour World championship in Italy. Greg was named "King of the Road" 3 years consecutively in the grueling Vol. State Ultra race. He also completed a solo, self-supported Badwater 146 in July of 2016. Greg, along with his family, combined his two passions of running and providing clean water solutions to create Run4Water. Greg invites others to run with a purpose. Derek Manous is a graduate of Belmont University holding a degree in entrepreneurship and marketing. Derek manages the business interests of Run4Water and is heavily committed to its missions around the world. He enjoys challenging tasks and creating innovative solutions. Derek is thankful for the many opportunities that God has placed in his life for ministry. Ashlee Redd is a freelance graphic artist applying her creative concepts to Run4Water. Ashlee creates promotional materials, logos, and creates the t-shirt, race and web designs. She went on her first Run4Water mission trip to Honduras in 2013. She has also volunteered her time and talents crewing Greg on many of his ultra running pursuits including the 2015 24 Hour World Championships in Italy and Greg's solo supported Badwater 146 run in the summer of 2016. Ashlee has finished several marathons, the most recent being the NYC Marathon. Whether you're interested in donating your time, money, or supplies, we want you to run with purpose! ​Just send us a note and we will get back to you shortly. Rachel Heronimus a student at Lipscomb University. Run4Water has changed her life and God has blessed her through ministry in Sneedville, Nicaragua, and Africa. She encourages anyone and everyone to get involved with Run4Water. Anna Kate Armstrong is 17 years old and a senior at Friendship Christian School. Anna Kate has been involved in Run 4 Water ministries in Honduras, Haiti, Nicaragua, and Africa. After her first trip to Africa, she came back with the idea to launch a companion ministry called 84 Days. She was impacted by the need girls have for feminine hygiene products. She most enjoys sharing the love of God with the children she meets. Caleb Ross is a freshman at University of Tennessee. 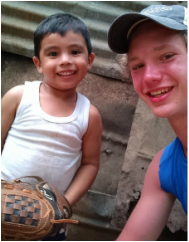 Caleb has been involved in both the ministries in Sneedville, Nicaragua, and Africa. He likes that Run4Water empowers young people giving them opportunities to serve others. Madison Kane is a student at the University of Tennessee. She loves the teamwork ministry Run4water offers. Madison loves not only filling physical needs, but spiritual ones, too. Building relationships is her favorite part of ministry.